I got this recipe from our neighbors, the Langs. The consistency is perfect, not too thick/pasty and not too watery . . . plus it’s packed with flavor. 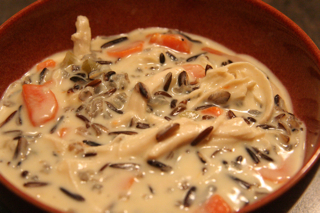 In a large pot, combine six cups chicken broth, wild rice, carrots, onion and celery. Bring to a boil, reduce heat. Simmer covered for one hour or until rice is tender. Melt the butter in a medium saucepan. Then add the four, salt and pepper. Stir until thickened, then add the whipping cream (or half and half if you are looking for less fat), and stir until thickened and all the lumps are out. Stir whipping cream mixture into rice mixture. Stir in chicken. Heat through, then serve.